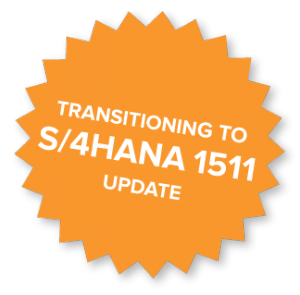 There is alot of discussion around 1511 as SAP increases its focus on encouraging SAP customers to evaluate and consider a shift to S/4HANA, and a strong emphasis on the HANA database and Fiori screens. With 1503 we were pleased to find that BAPI’s and transaction recordings for the most part continued to work without a major impact on Winshuttle users. However, some transactions went away in 1503 and a new universal journal table was introduced, making the aggregation tables redundant. 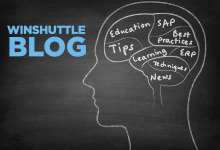 In 1511 the story is a little different – depending on what you use and plan to use in SAP. The Simplification List for SAP S/4HANA, on-premise edition 1511 covers everything that has changed. This list is quite substantial, covering many areas over 270 pages, and is not the same as the consulting notes or the release notes. Am I implementing S/4HANA 1511 as opposed to 1503? What transactions have I recorded? A simple lift and shift to the HANA database should have no impact. Winshuttle customers will have to take an inventory of recordings they have and compare these with the large list of over 600 transaction codes that are no longer used or impacted. In some instances, no options have been provided for continuing to use the SAPGUI and users will need to use a Web UI, such as Engineering Change Management ECR/ECO and the Customer Interaction Center. Some 1503 Fiori functionality has even fallen by the wayside, so this impact is not only on the SAPGUI. There are transactions that have changed or gone away completely, so comparisons must be made for critical integration scenarios. There is also a lot of interest around extending material number functionality. When extended material number functionality is switched on, there is no guarantee that all fields are filled in a way that can be transmitted through the old fields. The default setting in SAP S/4HANA and new installations, is that the extended material number functionality is NOT activated. Customers who would like to use a material number with 40 characters need to explicitly activate this functionality. If the extended material number functionality is activated in the system, it cannot be easily deactivated because values may exist in different fields that are only allowed with extended material numbers. Additional information on this can be found in the Extended Material Number in Suite Integration: SAP Note 2232396 and Length of Customer and Supplier Material Number: SAP Note 2232366. Winshuttle customers who have automated business partner creation and maintenance tasks, namely vendors, customers and business partners might feel the greatest impact. The transactions now converge on a universal tcode – BP – which is now used for all customer, vendor and business partner maintenance. From a tcode perspective, this means new recordings need to be created for FD01/02, FK01/03, MAP1/2, XD01/02, VD01/02, XK01/02 and MK01/02. 1803189: FAQ: End of Support of ME21, ME51, and BAPI_PO_CREATE etc. You can use transaction ME21N (ME22N and ME23N) or ME51N (ME52N or ME53N) with Winshuttle in somewhat limited circumstances, although errors may occur. For example, you cannot activate the document overview due to problems with the associated variants. Customers are encouraged to use the BAPI BAPI_MATERIAL_PLANNING. This BAPI has the same planning parameter options as the classical planning transactions, but the processing key NETPL cannot be used any more in that context. For many SD objects in S/4HANA 1511, only the most recent and most comprehensive version is available – deprecated versions have been disabled, including some deprecated BAPI function modules and SAPGUI transactions. SAP Note 2228098 contains a list of objects affected and successors. In some cases the successor has the same name. Some notable changes include VA05N superseded by VA05, SD01 by VA05 and VA25N by VA25 along with VA45N with VA45. Other areas to look at are cost element transactions like KA01/02 and KA06. There are also implications for credit management where FD32, F.34, FD24, FCV1 and FCV2 are removed. BAPI_COSTOBJECT_GETDETAIL and BAPI_COSTOBJECT_GETLIST are also no longer relevant. As with all upgrade scenarios, customers should remember to take inventory of their Winshuttle integration scenarios and determine the impact in a DEV/QA environment. Early detection of issues will provide an opportunity for early remediation. In parallel, Winshuttle is working on providing support for integration through ODATA, as an example of one of the methods you can use with Studio v11 because certain functions are being handled through Fiori screens which are supported by SAP NetWeaver Gateway services. More on this additional integration method will be provided as it becomes available.